Recently, the internet’s been buzzing over a new color Nexus 5. And now, it’s officially here. I know many of you are keen on the Nexus 5, so you’ll be glad to know that a new hue is available. 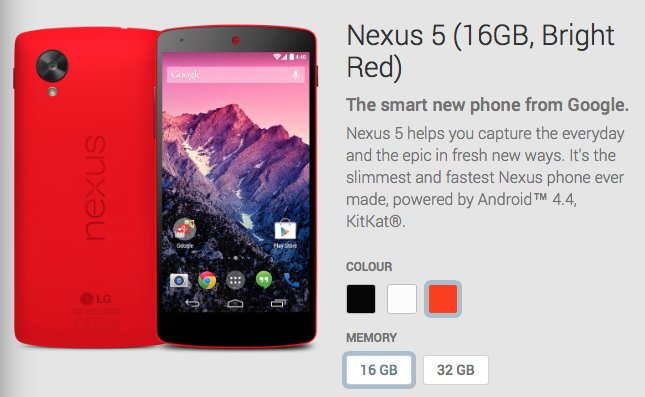 You can now order a bright red version of the vanilla Android phone from Google Play Store. Just in case – like me – the black or white didn’t tempt you. I’m now in the process of trying to restrain myself from buying it. Since it’s only available direct through Google, you’ll have to pay up-front for the device. If you fancy it, head on over to the product page and order one. ← Samsung Galaxy S5 to be unveiled at Unpacked event in Barcelona, Feb 24? Will tmobile website offer a red variant as well? You mean like pay over time in advance into a savings account? Or pay over time with a credit card interest fee? Managing money isn’t that difficult. I’m sorry. I wasn’t very clear. I mean paying over time as in the 0$ down, pay over 24 months. Some people aren’t able or willing to pay 350$ up front. the upfront cost of buying a phone outright is something that keeps many people from switching to contract free plans. I agree saving up before the purchase is best, but not everyone does. Decisions decisions haha my mom is stuck between this and the new xperia z1s doesn anyone know if the nexus 5 and xperia z1s suport tmobiles 20×20 network? Yes they are 2 of the phones that do, including the note 3 and s4 as well. Arite thanks she ended up choosing the xperia z1s. If not they will soon. Would anyone recommend trading in s4 for this phone(not red) Ive had jump for 6 months and cant decide on if I should trade in s4- or just wait for the next big thing. The more I use my nexus 7, the more I want to stick as close to a Google phone as possible. The bloat and tons of useless features on the s4 are getting to me. with is late Spring,late May,and June. I don’t have this phone,but that’s what I do,google it,then read the reviews. Hope this helps you.